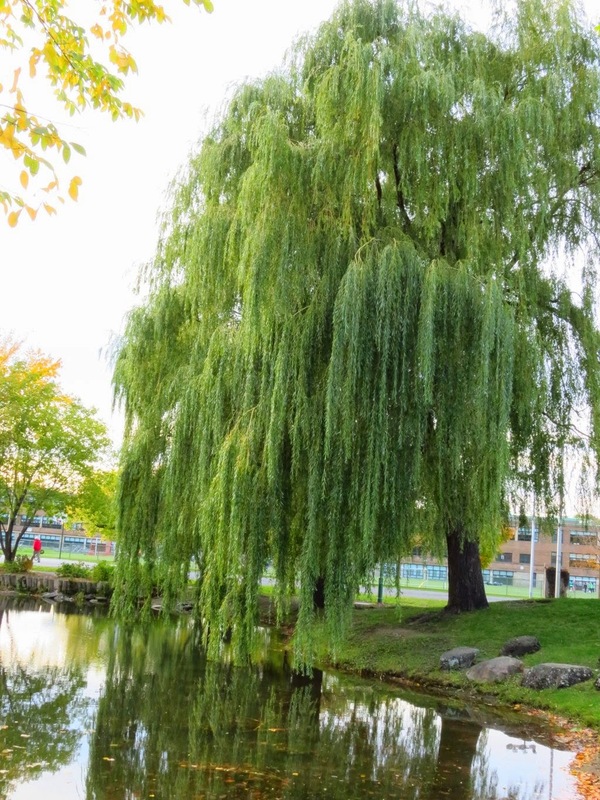 Salix babylonica .Babylon Willow.Weeping Willow.Trees Planet.2.bp.blogspot.com (Accessed 2/2017). Salix babylonica is a tree to 12 m tall; twigs yellowish, branches long, slender, drooping, brittle at base. Leaves alternate, about 10 cm long, 1 cm wide.Leaves expand early May; winter plant leafless 134 days (Britton 1874). Flowers dioecious, in catkins, emerging with leaves, April-May, insect and wind pollinated. Wetland status: NL but probably FACW. Habitat: Frequently planted in parks especially along water-bodies. Occasionally escaped. Tolerant of wet soil. Notes: Brittle twigs possibly adapted to vegetative propagation along stream banks. Buds and catkins eaten by birds and mammals (Martin et al. 1951). Notes: Sometimes infected by Armillaria root rot (Basidiomycotina, Hymenomycetes). A host tree of the Asian longhorn beetle, Anoplophora glabripennis (see Norway maple).